28. 1. 1898. Sombor - 20. 10. 1993. Sombor Milan Konjovic finished elementary and secondary school in Sombor between 1904 and 1916. He had his first exhibition at his high school in 1914, exhibiting some fifty works painted in nature. In1919 he was admitted to the Academy of Fine Arts in Prague, in the class of Vlah Bukovac. Having left the Academy after the second semester, he continued his education on his own, in Prague (an avant-garde Czech painter Ian Zrzavi introduced him to Leonardo's art), Vienna and through German museums in Munich, Berlin and Dresden. He arrived in Paris in May 1924, stayed there until 1932, and afterwards finally returned to Sombor. Rather successful one-man exhibitions (1931 "Galerie Bing et Cie", 1932 "Galerie van Leer", 1937 "Galerie Mouradian-Vallotton"), as well as participation in Paris Salon exhibitions, marked the beginning of his "blue phase" (1929-1933). He devoted himself to painting his hometown Sombor, its landscape, people and milieu with the passion of a visionary, whose authentic creative personality is sealed upon all his works. In summertime he painted in Dalmatia (Mlini, Cavtat, Dubrovnik). The "red phase" lasted from 1934 till 1940. In 1941 Konjovic was in Osnabric as a prisoner of war and when he returned in 1943, 1944 and 1949 he continued painting pastels. The oil works painted in subdued colors were realized from1945 to1952, marking the "gray phase" of the artist's work. 1953 is considered to be the turning point in Konjovic's painting: he regards the object more freely, and pure intensive colors glow on his "coloristic phase" works. New artistic orientation culminated and was to characterize the works of the "associative phase" (1960-1984). At that time Milan Konjovic engaged himself in the work of the artists' colonies of Vojvodina. In 1985 began the "Byzantine phase" with works treating various themes from Byzantine history. By the end of 1990 Konjovic had produced about thirty new works, completing the impressive opus of about 6000 oil paintings, pastels, water colors, temperas, drawings, tapestries, stage sets, costume sketches, stained glass windows, mosaics, graphics etc. This unique comprehensive opus affirmed the master through 297 one-man and about 700 group exhibitions in the country and abroad, in Prague, New York, London, Amsterdam, Sao Paolo, Rome, Modena, Athens, Paris and Moscow. The artist's legacy to his hometown resulted in the opening of the "Milan Konjovic " Gallery in Sombor on September 10 1966. Every year the collection has been expended by new donations and it now encompasses 1060 selected oil paintings, pastels, water colors, temperas, drawings, tapestries and other techniques. Apart from regular retrospective exhibitions the Gallery occasionally organizes the thematic exhibitions of Konjovic's works. 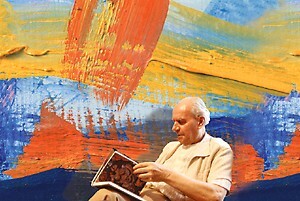 In 1979 he was elected a member of Vojvodina Academy of Arts and Sciences (VANU). In 1986 he became a corresponding member of Yugoslav Academy of Arts and Sciences (JANU), and in 1992 a member of Serbian Academy of Arts and Sciences (SANU). He received many significant domestic and international awards.